LEXUS UNVEILS THE UPDATED NX AND CT MODELS AT THIS YEAR’S FRANKFURT MOTOR SHOW. POWERFUL DESIGNS. SPORTIER INTERIORS. SMARTER SAFETY SYSTEMS. EXPLORE THE IMPROVED NX AND CT. Bold, brave design is on its way to this year’s Frankfurt Motor Show. We’re unveiling the refreshed Lexus NX and Lexus CT. Both the design and technology have been improved, building on the models’ strengths, to give you a more thrilling drive. With its combination of cool contemporary design and driving dynamics, the NX crossover has been a popular player in the Lexus range. Now we’ve given the NX a refresh with a powerful look and a smarter safety system. The NX’s revised design stands proud with a stronger, broader aspect and sleeker overall shape. We’ve updated the signature Lexus spindle grille, reshaped both bumpers, switched in 18 inch alloy wheels and a “no-touch” open-close rear door, giving the NX a design that means business. Meanwhile, the interior has gone through a set of detailed changes to bring out the NX’s sportier character and luxurious feel. The central display screen is larger, the climate control has been streamlined and the central clock now automatically updates to your time zone as you drive. There’s also a wealth of interior colour options to choose from, with the addition of Rich Cream and Ochre upholstery and trim, plus Flare Red and Mustard Yellow for the NX F SPORT models. Discover a dynamic fresh look for our compact hybrid hatchback. This evolution gives the CT 200h an upgraded safety system, plus an exterior that embodies its exciting-to-drive nature, without compromising its simplicity and impressive fuel economy. We’ve elevated the CT’s sophistication with a more modern and aggressive design to fit active lifestyles and project a powerful presence on the road. The profile gets a boost from sportier wheels, while refinements to rear-end adds athletic appeal. Additionally, you now have a choice of interiors with our expanded colour palette featuring combinations including striking two-tone smooth leather, a mix of fabric and long-wearing synthetic leather, and an all-fabric upholstery. The CT 200h F SPORT model sees the most significant design updates for 2018. On top of its mesh patterns and high-grade headlights, this model also features exclusive black plating on grilles and trims, and exclusive two-tone exterior colours Lava Orange CS (Crystal Sunshine) and Heat Blue CL (Contrast Layering). Inside the cabin, the F SPORT model boasts exclusive interior combinations including two-tone leather, fabric and synthetic leather plus a two-tone exterior. 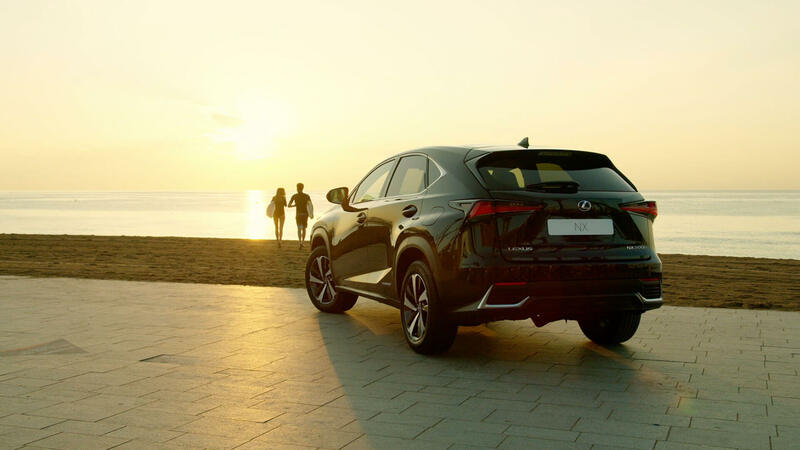 The upgraded NX and CT also include our innovative Lexus Safety System+ (LSS+). This driver support system uses intelligent technology that actively works to keep you safe on the road. LSS+ features Pre Collision System, which scans the road ahead for hazards and even automatically reduces your speed in an emergency. Meanwhile our Adaptive Cruise Control and Lane Departure Alert keep you driving smoothly and on track while cruising down the motorway. Then, in addition, our Adaptive High-beam System and Road Sign Assist give you more control and confidence as a driver. We’ll also be introducing the enhanced Lexus Safety System+ A in our all-new flagship luxury sedan, the Lexus LS. LSS+ A improves upon the LSS+’s features and premieres world-first technology. This includes: Active Steering, to automatically guide you out of the way of obstacles or pedestrians; Lexus CoDrive and Lane Tracing Assist, to keep you on the right track even when there are no markings on the road; and Front Cross Traffic Alert, to keep you safe at intersections.